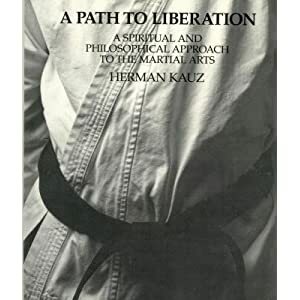 Last month I picked Herman Kauz’s A Path to Liberation: A Spiritual and Philosophical Approach to the Martial Arts to read for homework. Master Pearson had recommended it and by process of elimination (out of all the acceptable books on his shelves – I had either read it or it was too darn long) I brought it home with me. I plowed through the brief 119 pages (with 17 pages of pictures!!) At first I thought the book would be a bit outdated (it was published in 1993) but as it turns out, Kauz speaks to classical, timeless sentiments about the practice of martial arts. His overall message is both intriguing and ever-relevant. Kauz, who has been practicing martial arts like Judo, Aikido, and Tai Chi for over 45 years, made several interesting and intellectually sound points throughout his book. It is clear that if by nothing other than shear time, he has developed quite a strong philosophy and ideology of what makes a good martial artist and what constitutes good practice. While there were certainly some arguments that spoke to me more than others, and even some which I disagreed with, overall the book nicely complimented most of the teachings which I have been fortunate to gather from my teacher(s) throughout the years as well as that which I have discovered for myself through introspection (that seems like a very poorly worded sentence – sorry for all you grammar freaks out there!). These words spoke so much truth to me. The realization of the interconnectedness of body and mind is an essential part of martial arts practice. Even after my own 20 some odd years of practice, I feel like I am only just beginning to penetrate this deceptively simple concept. Some of our practices naturally lend themselves to making this interconnectedness painfully obvious (and yes, I mean painfully!). Why do we sit on our knees in zazen before every class? Why do we take the time to quiet our minds? Is it not to pave the way for a successful training session, to allow our minds to be open even as we are developing the body and our physical technique? Why have the four of us been spending all this time slamming our hands into various training apparatuses and terribly bruising our finger tips, palms, and the back of our hands? Sure, we conditioning our bodies to be more impervious to blocking strikes and offering more effective blows, but are we also not simultaneously training our minds to stand up to the pain? Or take the five element forms as a third example. Why is it that we have to follow a certain pattern, flowing from one form to the next? Because it is intellectually difficult to do so? The forms are one thing, physically we can all do them with a little bit of practice. They are not long and they are not particularly hard. The challenge for these forms is a mental one – remembering the patterns of destruction and creation and aiming to make a seamless transition from one form to the next — both physically and mentally. Kauz deals us an interesting challenge; to look at our physical practice from a mental perspective. This is not easy and it requires a lot of vigilance but how worth it! How much better will our techniques become if we successfully and completely integrate the mind and the body? There are those colleagues of ours who practice martial arts purely as a sport – they relate to their art as an athlete would and this is the mentality by which they approach their practice (although to be fair I know many athletes who really understand this mental and physical integration — I think it’s fair to say that these rare, gifted, individuals view their sport as an art, in stark contrast to those martial “artists” who view their art as a sport!). I would argue that these are the folks Kauz is pointing his finger at when he writes “those who consider martial arts in this way are almost always people who have no real experience of doing martial arts.” Real experience does not, after all, take place in a ring or an arena, in two, three minute rounds, while wearing pads and scoring points. This, in and of itself, does not require the cultivation of the mind, only that of the body. And therefore, this, in and of itself, is not martial arts. Requirement fulfilled – with 3 hours to spare!